Buying your first house and walking through the door for the first time as a homeowner is very exciting. The flip side is that homeownership also comes with a lot of added responsibilities. There are many home maintenance items that we are often simply unaware of or neglect. These simple maintenance items can often become major repairs if neglected too long. 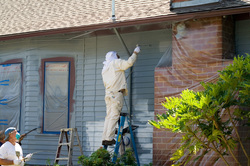 As home inspectors we try to educate homebuyers on the issues their particular home may encounter. As a part of InsideOut Home Inspection's service we are always looking to provide the homeowner with information to help you have a happy safe home that will last the test of time. Every spring after the snow melts it is time to check your roof. Sometimes there is a tell tale sign like a leak, but most times the damage is not as obvious. So taking a few minutes to view your roof can prevent small problems from turning into big ones. A good amount can be seen from the ground with a pair of binoculars. 1) Broken, cracked, or missing shingles. 2)Cupping or curling shingles, all the shingles should be laying flat. 3)Dark patches, a sign granules being worn away. 4)Slots on three tab shingle that are wide, as the shingles age they shrink and these slots widen. 5)Damage from ice dams and roof raking. 6)Flashings around chimney and skylights. As the shingles age they become brittle and shrink which can accelerate any or all of the above issues. Average life expectancy of asphalt shingles is 20 years. If the damage is limited and the shingles fairly new repairs may be sufficient. If the damage is more widespread and the shingles are older replacement may be best. So after this winter which was extremely harsh get out there and take a look before you have water in your house. Reminder to keep you vents clear of snow and ice during the winter season. The large amounts of snow we can receive can block vents and create a dangerous situation with exhaust fumes backing up into your home. Generally the exhaust will keep itself clear but under certain circumstances such as height of the vent and large amounts of snow over a short period of time they can cause snow to melt and refreeze as ice, completely blocking exhaust and intake pipes. So if you have direct sidewall venting be safe and make sure they are clear. When buying a home with elevated levels of radon in the air it is recommended to install a mitigation system. Typically a level of 4 pCi/L or higher should be mitigated to reduce the long term health effects of radon gas. For most cases an installation like the one pictured will reduce the radon to safe levels. This system will give the radon a path from under the foundation or slab up and out into the exterior of the home where it can be diluted into the air. The natural breakdown of rock causes radon to be released. Diluted into the air it is minimal, but when we trap it in our homes the levels become elevated and health issues have been linked to long term exposure. 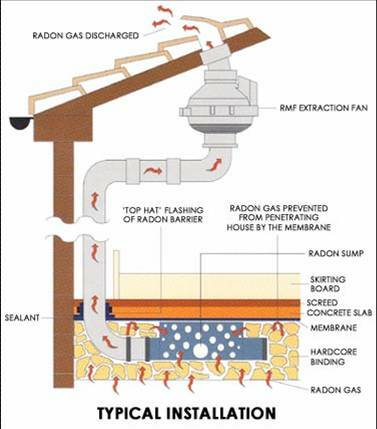 The more tight and energy efficient we build our homes the more radon can be trapped in the home. 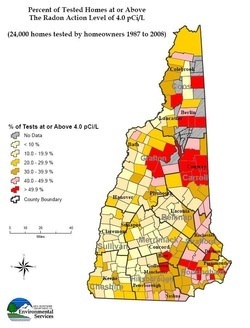 Testing individual homes is the only way to determine for sure of the level of radon present. Installing a mitigation system when necessary will keep the levels below the danger line. Systems cost on average from $1200-$1800 installed. If you are purchasing a home with a private well, then water quality testing should be important to you and your family. Many contaminants often have no taste, odor or color. Their presence can only be determined by laboratory testing. DES recommends that prospective homebuyers test the water in a home with a private well before purchase. Water quality in wells is typically stable and testing every 3-5 years is recommended. Bacteria and nitrates are exceptions and it is recommended they be tested every year. Here are several links with beneficial information for byers and home owners with private wells. Having a generator ready for power outages in New England is a great idea. It can provide peace of mind and allow your family to be comfortable and safe at home during severe weather. Making sure we understand how to operate them and operate them safely is imperative. After all keeping us safe and secure is the goal! The article below details some basic rules for operating a generator safely. Great information for homeowners on the evolution of residential wiring and the safety improvements that have occurred through the years. From knob and tube wiring, fuses, grounding, breakers, GFCI and AFCI. Summer is quickly coming to an end and in New England the urge to be prepared for the long winter months ahead will soon kick in. Making sure your heating wood is properly stacked and ready to burn is a growing concern for many. Typical time for green wood to dry and be ready to burn is 6 months. This article offers some general guidelines to make sure your wood is ready and that you don't get left out in the cold. With the colder weather here for many of us, it a great time to evaluate the level of insulation we have in our attics. Your insulation's r-value will determine the possible need you might have and benefit you might gain from adding insulation. 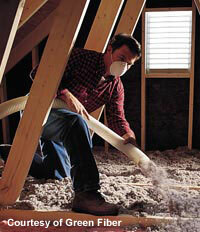 Adding insulation to the attic is generally a moderately difficult do-it-yourself (DIY) project. The good news is that, even if you're not comfortable taking on this project yourself, there are many qualified contractors who can help you get the work done. The energy star website has a wealth of information on insulation projects and improvements as well as the amounts recommended for your geographical climate zone. Cleaning your gutters is an easily overlooked maintenance item. Every year they become clogged with leves and debris. We recommend they be cleaned in the fall and the spring. 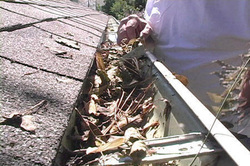 Another option is to put a cap system on your gutters to keep leaves out and avoid yearly maintenance. 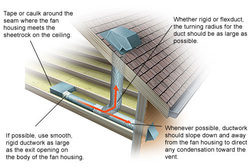 Please click the link below for more informaton on gutter and downspout maintenance. Lack of proper venting in bathrooms is a very common occurence. Simply not having any venting and improper terminantion. Proper venting is critical to removing moisture from your bathrooms. This moisture can cause many issues, the biggest issue being mold. Mold in the bathroom on walls and ceilings, and mold in the attic if not properly terminated to the exterior. Most of us will not travel to our attics too often and the ongoing effects could be creating serious damage and health implications. Checking annually is a good idea but even better is to check in the fall before winter weather and again in the spring after the winter. In New England we can have extreme weather events throughout the year and during these events are when most roofs can suffer damage beyond normal wear and tear. Again the goal being catch and repair the situation before it causes other major issues. 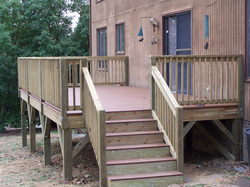 Proper deck maintenance is extremely important to the safety and longevity of your deck. Here is a checklist for your homes deck which will help your deck last and keep everyone safe. Items that should be monitored and corrected as needed, so you can enjoy the outdoors on your deck safely and worry free. Having your heating system serviced is a very important annual maintenance item on the homeowners list. 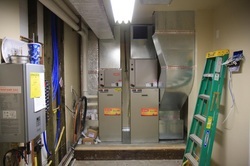 To insure the system is running at peak efficiency, which saves you money, it should be cleaned anually. We recommend choosing a company that is not your fuel provider. 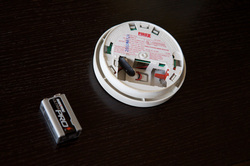 Have it serviced just prior to heating season so you can be worry free and avoid an emergency call on a January night. Please click the link below for more information on maintaining your heating system. heating it up. When water from melting snow gets to the bottom exposed section where the eaves begin, it re-freezes and creates a dam, and then the water accumulates behind it. 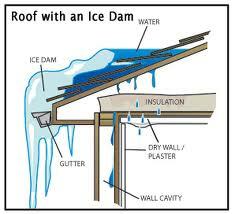 The two most important factors in preventing ice dams are insulation and ventilation. For more information please see article below. The most important and often forgotten maintenance item for your families safety. Know where they belong and how long they last. Read the article below for more information. 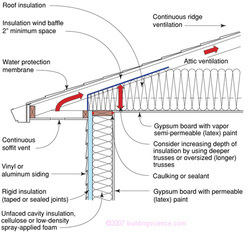 explaining the basic principles in attic venting. install them in all the requred locations. 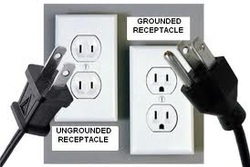 Ground fault circuit interrupters are a very important safety feature of your electrical system. 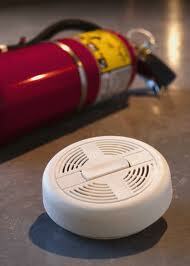 Understang where they should be in your home as well as how they work will keep you and your family safe. It is recommemded they be tested monthly with test button and replaced immediately when faulty. 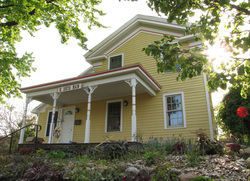 Proper maintenance is critical for the life of your siding. Replacing wood siding is very expensive. Paint or stain should be applied approximately every five years or at the first signs of wear. If you wait too long, till the paint is cracking and peeling the job involves much more labor and becomes much more expensive. Before you use that new fireplace or wood stove it is important to have your chimney inspected and cleaned by a licensed chimney sweep. This will insure the lining in your chimney is in good repair and not obstructed. Chimney fires are very dangerous and can be prevented with proper annual maintenance. 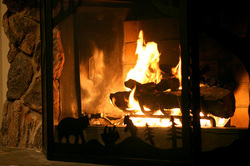 Enjoy the warmth and coziness of that fire with the peace of mind. Why have P-traps vs. the old style S-traps. 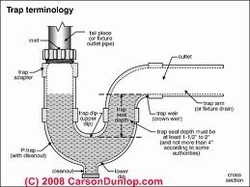 sewer gases from passing from the drain pipes back into the home. Often forgotten simple maintenance, winterizing your exterior hose bibs. If you live anywhere the temperature can drop below 20 degrees F you should winterize to prevent freezing and bursting pipes. Dryer vents should be checked and cleaned at least twice a year. Your dryer will use more energy to dry a load of clothes. The lint is highly combustable and eventually could start a fire. A very simple habit of checking and cleaning out the exhaust on the exterior of the home could save your home and lives. Click below to read more facts on proper dryer venting and maintenance.